I seem to be doing a lot of cooking now that the weather is cold. My ramblings have been confined to my kitchen. I so dislike being out in the low temps we have been experiencing this week. I got a late start today, so I searched my pantry and refrigerator for ingredients that would make a good soup. 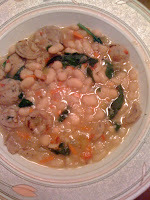 This soup supper took less than one hour from start to finish and proved to be very satisfying. The accompaniment to the soup was Gibbie sandwiches. Gibbie is a term coined by my mother when we were kids. Mom just celebrated her 88th birthday, so this term has been in my family for many years. Gibbies can be made from any sandwich. My mom, who was a great cook in her time, would simply cut the sandwiches into bite size pieces so that we kids could eat them easily. She always told us that they tasted better when served this way! I have no idea where she got the term, but it has been passed down to my children. Gibbies are always better than plain sandwiches! 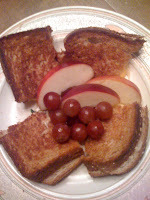 I made grilled cheese Gibbies using double fiber whole wheat bread with Taleggio, mozzarella and cheddar cheeses. I happened to have the Taleggio (an Italian, soft, cow's milk cheese) from a recent trip to Whole Foods. The other cheeses are a staple in my kitchen. The combination of cheeses worked very well. The blend of the three proved very tasty! Coat a Dutch oven with Pam and saute' about 1 cup each of chopped celery and onions. 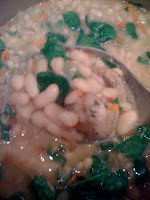 When these are tender, stir in about a teaspoon minced garlic and a handful of slivered carrots. Stir constantly over low heat until the carrots are tender. Add about 1/2 pound sliced sausages of your choice. I had some low-fat chicken sausages, so I used those. Allow the sausages to brown and then add about 3 cups of chicken broth. In the meantime, open two 16 ounce cans of Great Northern White Beans. Pour these into a colander, rinse with cold water and drain off the liquid. Stir the drained beans into the pot. Allow the mixture to come to a boil. Turn the heat to low and simmer for about 15 minutes. Just before serving, tear a handful of fresh spinach leaves into small pieces and add to the pot. Stir to mix and cook just until the spinach wilts. While the soup is simmering, prepare the Gibbie sandwiches as described above or use your own combination of cheeses. Use what you have in your refrigerator. Don't get out in the cold weather to collect the ingredients. 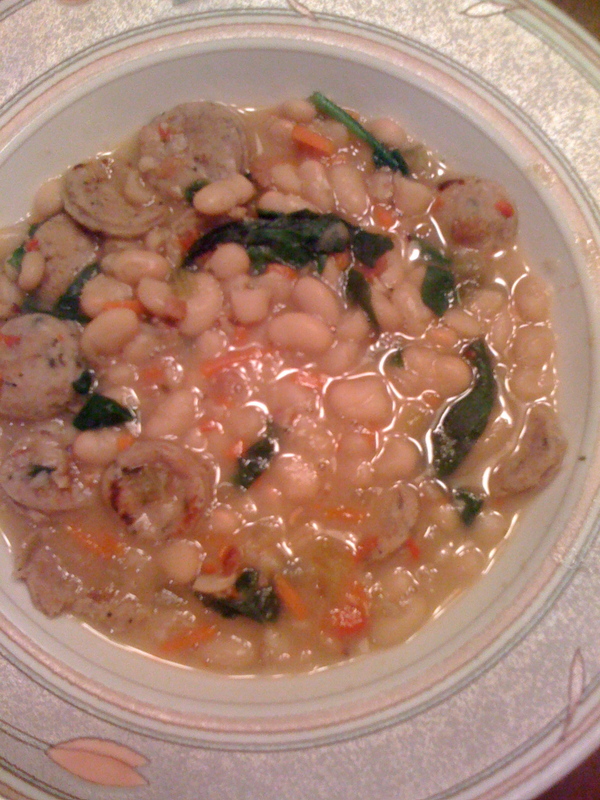 I don't know the nutritional values for this recipe, but I believe it is very healthy with the beans, spinach, low fat chicken sausages and the sauteed vegetables. The cheese sandwiches are rich in protein and fiber. Instead of butter for the grilled sandwiches, I used a butter substitute spread. The best part is that the entire meal can be prepared in less than an hour. I must mention that we drank a couple of glasses of a wine we also had on hand. It's one of my favorites: Ferrari-Carano Fume' Blanc. What a great way to dine on a cold winter night! I'm going to make this Dot, looks & sounds delicious! and...very easy! Let me know how you like it.